For those of you who don't know Pannel farm, it is an organic vegetable farm based in Icklesham, just 3 miles outside Hastings. 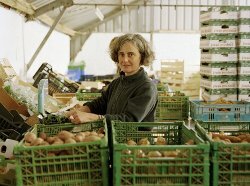 It has received Soil Association Certification for over 9 years now and is run by the lovely Metske. He delivers fresh veg to Trinity every Monday and Thursday morning from Spring through to late September. We adore the fact that we have such a fantastic organic vegetable farm practically on our doorstep! To eat produce that has been hand picked that morning or the day before is heaven! Enjoy and thank you to all the workers at Little Pannel Farm! 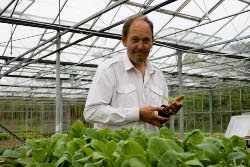 In 2008 members of Trinity co‑operative visited Hankham Organics, just outside Pevensey, and were delighted to learn that due to recent expansion, the farm could now include Hastings in their regular deliveries! The business was founded in 2002 and it has been granted organic certification from the Soil Association. Resident growers Miles Denyer and Peter Dollimore took on the challenge to painstakingly restore the derelict Victorian glasshouses on site, one of these being a massive 1.5 acres in size and the largest in East Sussex. This undercover method of growing means that Hankham Organics can provide Trinity with a year round supply of fresh vegetables. Trinity is also a pick up point for customers to collect pre-ordered, pre-paid veg and fruit boxes after 3pm each Thursday when Hankham Organics deliver to the shop. Trinity is delighted to stock locally-produced bread from Judges Bakery, based in Hastings Old Town, a traditional high street baker, originally founded in 1826. Judges bake fresh bread every single day on the premises and deliver to Trinity every morning. They use exclusively organic flour from the award-winning Shipton Mill. The sourdough and rye loaves are left to rise very slowly overnight before being baked and as a result have a unique flavour and texture. All the bread is organic and certified by the Soil Association. 'Hen on the gate' organic eggs are produced at Clayton Farm, Mayfield, set in the heart of East Sussex. They produce the finest award‑winning eggs to the exacting standards set by the Soil Association. As a small, family-owned and run farm, Clayton Farm owners share our customer's passion for high quality and locally produced food. Their farming methods nurture and protect the local environment, while allowing animals to live in small herds and family groups. In 1974, Roy Cook was presented with a dramatic opportunity to drop out of the rat‑race when he inherited ten acres of land near Sedlescombe, East Sussex. "I thought about planting tomatoes, but then I discovered I had all the right conditions for growing vines. I was in the South East where the revival in English wines was beginning, and the land I owned was on a south-facing slope, exposed to the sun. I wasn't at the bottom of a valley where you get frost and wasn't at the top where you get high winds. It was ideal." So began Britain's first organic vineyard. Today the vineyard has expanded to 23 acres, which includes the vineyard at Bodiam Castle, converted to organics in 1994 and the vineyard at Spilstead converted in 2006. Although there are a total of around 400 vineyards in Britain, Sedlescombe is one of only four which have adopted organic methods. 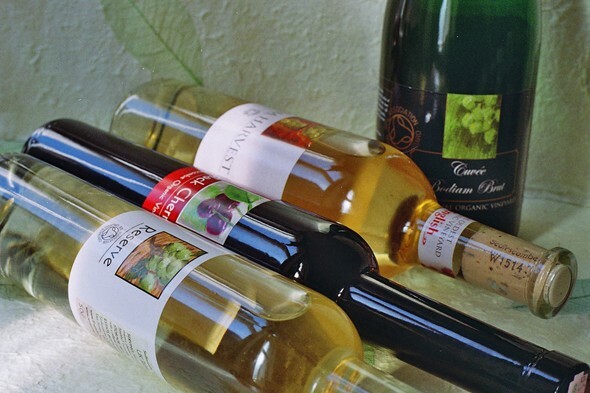 All of Sedlescombe vineyard's wines are produced according to Soil Association organic standards and we are especially lucky to have such a prestigious vineyard on our doorstep! On 1 September 1999 Oakwood Farm achieved its full organic status and received official organic certification from the Soil Association. Oakwood Farm only use naturally-occurring substances approved by the Soil Association: absolutely no broad‑spectrum pesticides or insecticides are used in the their orchards. They are a great example of how organic production can sustain a natural, diverse and healthy balance between the crop, which the farmer introduces, and the surrounding ecosystem. Maintaining good soil and beneficial wildlife ‑ plants, insects, mammals and birds ‑ that control fruit pests. Trinity is proud to stock Oakwood Farm Apples whilst in season and throughout the year we have a range of Oakwood farm juices for our customers to enjoy! Conscious Chocolate is based in Kent and the bars are hand made, sugar free, gluten free and vegan! They use recycled aluminium foil and recycled paper in their packaging and all wrapping is patiently done by hand! All the ingredients are ethically sourced and traded fairly. Our range includes Love your Heart, Mint, Orange, Nicely Nutty and Love Potion No. 9! What is raw chocolate? The bean, or nib of the bean from the cacao plant in its natural state - not cooked, over-processed or mixed with a vat of cheap filler ingredients. No vegetable fat, milk or sugar goes near it and, importantly, it isn't heated above 42C, the point at which nutrients start to die. "Proven to increase focus, alertness and 'feel good factor'!" Our locally produced honey is unfiltered, which means it is as natural as possible with none of the goodness taken out. The pollen and minute wax particles remain in the honey and only the larger pieces of wax are removed by roughly sieving. 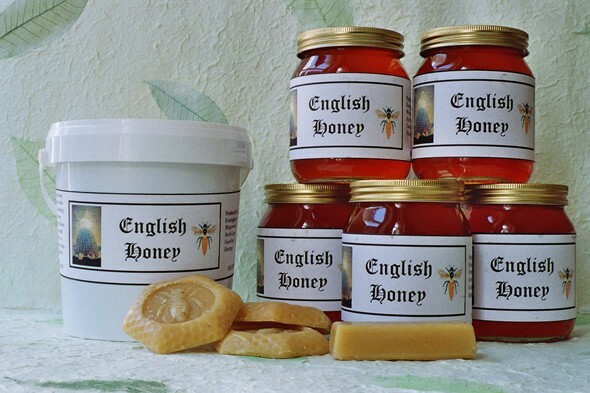 Guestling honey is polyfloral, derived from the nectar of many types of flowers, different from monofloral honey, where the bees only obtain nectar from a particular species of flower e.g. Manuka honey. It is suggested that hay fever sufferers eat a small amount of locally produced honey little and often, about a teaspoon a day from February onwards, to help desensitize the body to local pollen. This is not scientifically proven but many of our customers claim that small, regular doses of the honey is the key to getting some relief during the summer months. Helios is one of the world's leading homeopathic pharmacies; its healthcare and manufacturing unit is based in Tunbridge Wells. The business was founded over twenty years ago and has grown to serve homeopathic practitioners, students and the public worldwide and has never lost touch with its founding principles ‑ "to create a new source of potent, accurate and effective homeopathic remedies to bring about profound healing and relief of suffering". 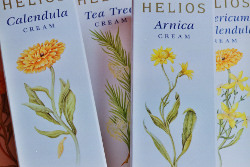 Trinity stocks a basic but essential range of Helios creams which are all suitable for our vegan customers. Majik Blanket cruelty‑free skin care products are made with natural and organic ingredients, which do not contain any animal ingredients. All products are 100% vegan and the company is registered with the Vegan Society. None of the products contain Sodium Laureth Sulphate or parabens. Hand made in small batches to ensure freshness. The Visionary Soap Company is the UK's only body care company dedicated entirely to being a fair trade business. All their products are organic and handcrafted in their workshop in Hastings. Trinity Wholefoods believes that the elements of fair trade, organic & handmade make this company exceptional and based on customer feedback, you think their products are great too! Visionary Soaps source most of their ingredients and accessories through a combination of Fairtrade Foundation UK, IFAT and BAFTS Certified partners in Palestine, Nepal, Sri Lanka, Madagascar, The Comoros, Bali, The Philippines, Thailand, India, Cambodia and Ghana. None of the products contain synthetic dyes or fragrances, parabens, petroleum-based ingredients, alcohol, sodium laureth sulfate or animal products. They are simply made with the finest organic oils, herbs and spices. All products have been safety assessed and comply with current EU regulations as well as being fully certified by The Vegan Society. The simple, minimal, recycled, recyclable and/or compostable packaging make them an attractive present too. Their promotional materials and fair trade gift packaging are made from post consumer waste & plant fibres and their workshop is powered by 100% renewable energy. They even use a green broadband/telephone provider! In brief they are dedicated to produce premium quality, organic products whilst at the same time incorporating values of social responsibility, environmental sustainability and holistic wellbeing. Visionary Soaps believes in empowering communities through fair trade and in creating jobs and contributing to our local economy and since we at Trinity are of the same mind we are delighted to stock their products! Chinwe, who set up Shea by Nature in 2005, pays over the odds for the raw product ‑ Shea butter, which is processed largely by women in Ghana and a new group she has recently started in Nigeria; cooperatives she helped to set up and support. Back in Hastings, the unrefined Shea butter is blended with other nourishing natural and vegan oils, scented with aromatherapy essential oils and enriched with herbs. Her skincare blending methods use traditional African techniques, passed down from her Mother, who made skin care in 1960s in Nigeria. From a magical childhood experience grew the successful business Chinwe runs today, offering a balm for people who care about poverty, the environment, their body, and what they use on it. Hemp Garden was conceived in 1998, became a reality in 2000 with a Prince's Trust Start-up Loan and a lot of hard work and is now based in Hastings. "2001 saw our first hemp crop in North Cornwall and we subscribe to the 'Triple Bottom Line' principle ‑ that business should be not only economically viable but equally, environmentally responsible and socially equitable." 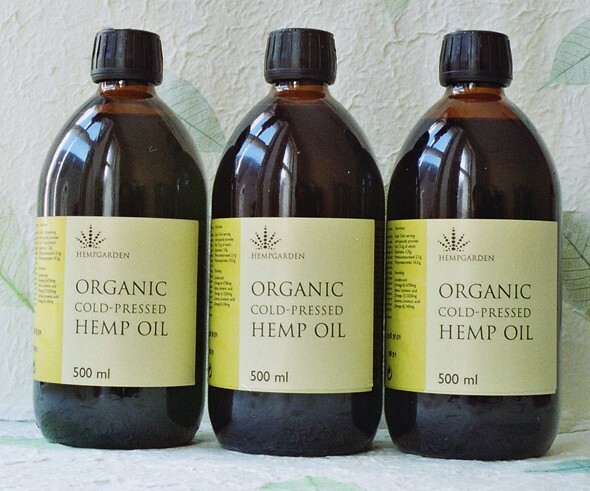 "We use only the finest hemp seeds for our cold-pressed oil, insisting on dark glass to protect the oil and prevent synthetic contamination. Our oil is nitrogen capped to ensure that it remains as fresh as the day it was pressed." A very popular product with our customers and delicious served in a small bowl with balsamic vinegar or furikake seasoning accompanied with fresh bread!